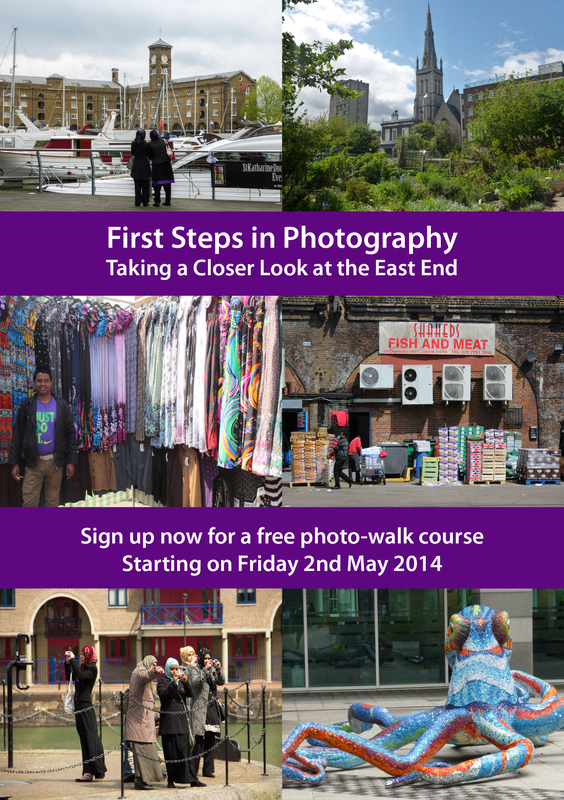 We're currently recruiting participants for the next 'First Steps in Photography' course. It's open to women living in Tower Hamlets who are currently unemployed or working part-time (up to 16 hours per week). In summary, the course offers a mix of photography tuition, local interest, and working together to create a group photo-book and personal photo-cards. We'll be exploring Shadwell, Whitechapel, St Katharine's Docks and the surrounding areas. No previous experience of digital photography is required, just a willingness to attend all of the sessions and give it a go. The course runs on ten Fridays, 10am-1pm, starting on 2nd May. Help with childcare, travel costs and a Bengali interpreter are available upon request. To download a PDF flyer and booking form, click here. Get in touch as soon as possible if you'd like to apply – these course generally fill up very quickly! Thanks to funding from Awards for All, local residents can try their hand at journalism on a free ten-week course that we're running in conjunction with Oxford House. Over a series of practical, beginner-level workshops we'll walk you through the basics of journalism, including researching your ideas, interview techniques, feature writing and using photographs. But this is more than the theory. Throughout the course, we'll work together to create The Insiders' Guide to Bethnal Green 2014. By the end of the project, you'll have some of your work in print. 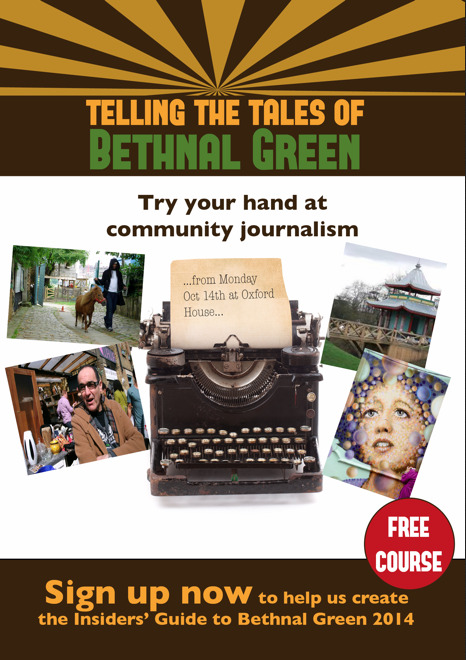 No previous experience of journalism is required, just an enthusiasm for exploring Bethnal Green, trying out the activities and giving it your best shot. The course runs on ten Mondays starting on 14th October, with sessions from 10am-1pm. 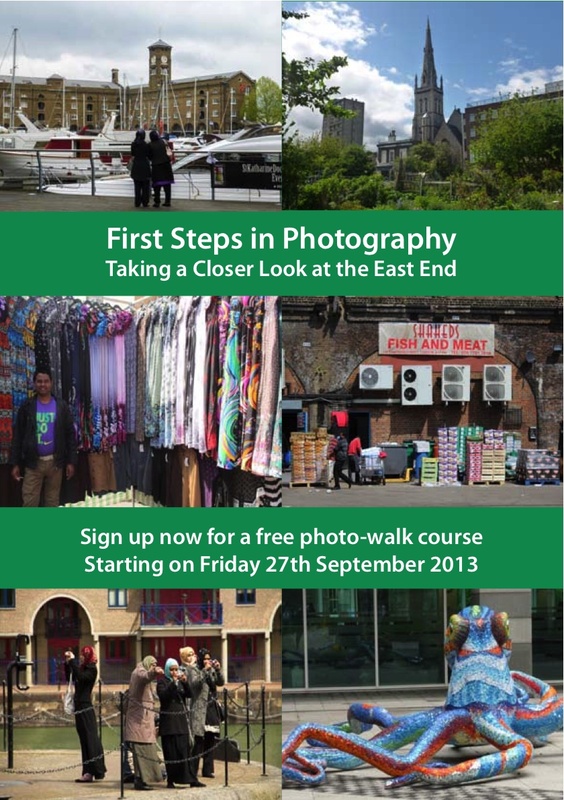 We're currently recruiting participants for the next 'First Steps in Photography' course. It is open to women living in Tower Hamlets who are currently unemployed or working part-time (up to 16 hours per week). No previous experience of digital photography is required, just a willingness to attend all of the sessions and engage with the project. The course runs on ten Fridays, 10am-1pm, starting on 27th September. Help with childcare, travel costs and a Bengali interpreter are available. 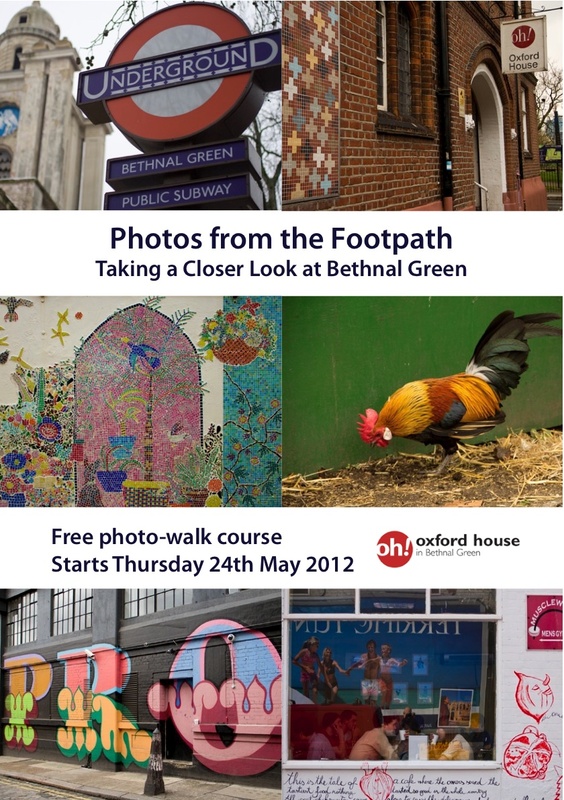 Over the last three years we've run several photo-walk courses around Bow, Mile End and the surrounding areas. 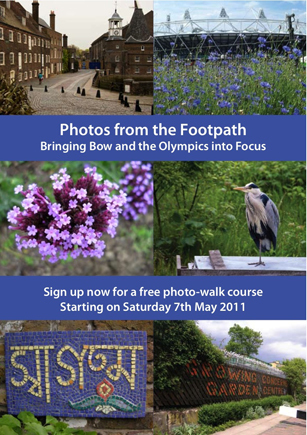 We've pulled together some of the photographs taken by participants to create a lovely walk booklet. 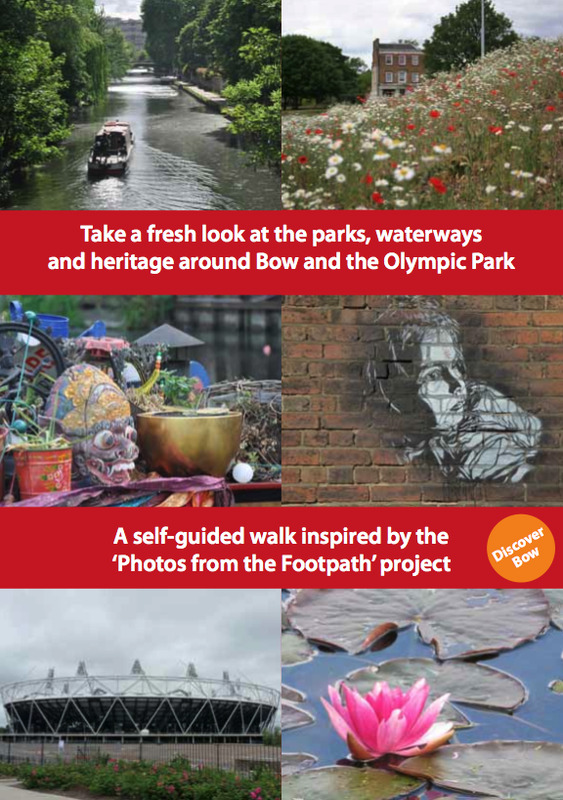 Why not download a copy and head out to discover some new sights? The booklet's based on a six-mile circular walk around the area, but it's easy enough to walk it section by section, hopping on and hop off using public transport links. Highlights along the way include greenery at Mile End Park and Victoria Park, boatlife along the Regent's and Hertford Union Canals, a salmon smokehouse and cafe on Fish Island, views across the Olympic Park from the Greenway, historic Three Mills and Bow Church, and a wild woodland nature reserve at Tower Hamlets Cemetery Park. All of the photos in the booklet were taken by local residents. To them, and our funders Action for Bow, we say a big thank you. Thanks to funding from Near Neighbours, local residents in Stepney and Whitechapel will be able to look more closely at their neighbourhood on our next free 'Photos from the Footpath' course. Over five weeks, an inter-faith group of 'near neighbours' will explore together, cameras in hand. We'll then work together to create a shared photo-book of our stories. Each week there's something new to photograph, such as street life on Mile End Road, friendly farm animals at Stepney City Farm, mosaics and murals dotted around the neighbourhood, and an architectural mix of Victorian terraces and post-War tower blocks. Along the way, we also visit local places of worship, with a chance to chat with our hosts. To download a PDF flyer and booking form for the latest course, click here. Each week there's something new to photograph, whether it's street life at the local markets and shops, friendly farm animals, vibrant street art, or an architectural mix of Victorian terraces and post-War tower blocks. Along the way, we also visit local places of worship, with a chance to chat with our hosts. Each week there's something new to photograph, whether it's street life at the local markets and shops, grow-your-own gardens, friendly farm animals, vibrant street art, or an architectural mix of Victorian terraces and post-War tower blocks. 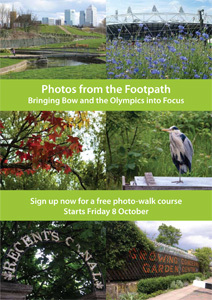 Thanks to sponsorship from Action for Bow, places on the course are free. Priority will be given to people living in Bow, and we can provide a camera if you don't already have one. Two more Photos from the Footpath courses – apply now! 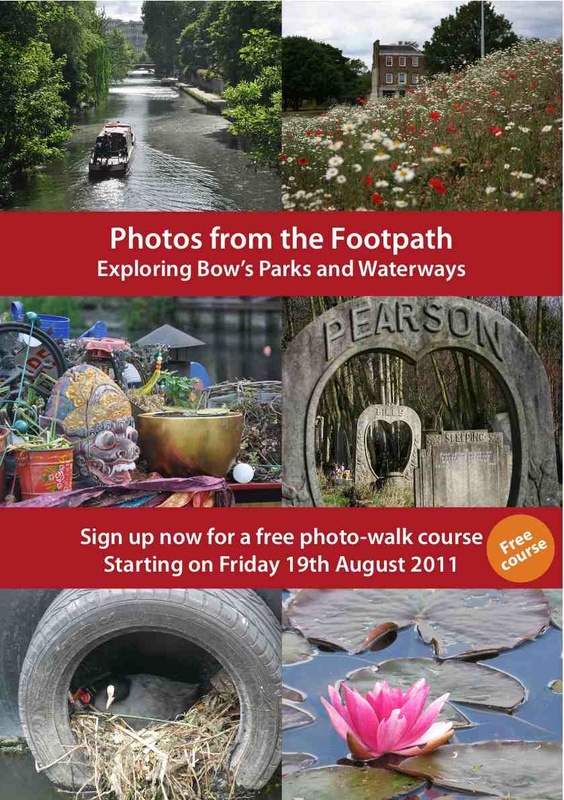 Over five sessions, we'll explore different walking routes around Bow, using photography as a focus. You'll learn how to compose, take and review digital photographs, inspired by the local area, its green spaces, street scenes and stories. In the final session, we create a group photo-book and all participants receive a free printed copy. To download a PDF flyer and booking form for the course, click here. Calling Bow residents. If you'd like to develop your photography skills whilst enjoying some fresh air, then sign up now for a free photo-walk course. Over five Friday afternoon sessions, starting on 8 October 2010, we'll explore different walking routes from Mile End Park to the Olympics site, using photography as a focus. There's always something new to see and photograph, whether it's local history on the Bow streets, wildlife in Mile End and Victoria Parks, architecture on Fish Island or the latest developments on the Olympic site. Sound interesting? Then join us on the Photos from the Footpath course! To download a PDF flyer and booking form for the course, click here. If you're not able to join us on this course, but you'd like us to notify you of future photo-walk courses, then get in touch. Thanks to Action for Bow for funding this project. As local walking experts, we were asked by the Tower Hamlets active travel team to support Walk England in the route planning for a new series of Tower Hamlets walking maps. 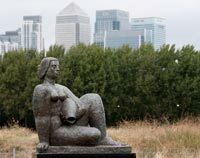 Organised by neighbourhood, each of the eight maps provides between three and five suggested walking routes, to make the best of the borough's green spaces and waterways. The maps have now been published, in printed tear-off pads, and also as online downloads. Take a closer look at the Tower Hamlets walking maps. We'd be interested to know what you think of them. And if your community group would like a supply of the printed maps for your area, to distribute and use in your activities, then get in touch.